Fresh organic pork medallions. 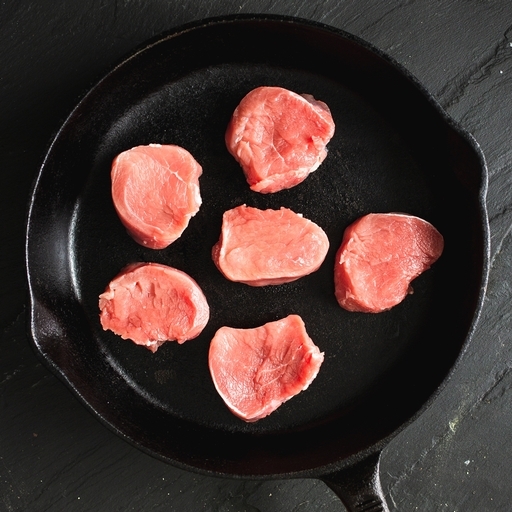 The pork equivalent of fillet steak – luxurious, ultra-lean and mouth-wateringly tender. Quick and easy to grill or fry for weeknight dinner. We love them with buttery mash and braised greens. Serves 4. Season generously on all sides. Pan fry in a very hot, oiled frying pan for 2 mins a side, until just cooked through. Try and get as much colour on them as you can; it all adds to the flavour. Leave to rest somewhere warm for 5 mins before serving. They take well to being marinated first, but will take a little longer to cook.